This book helps you: eliminate cold calling forever; get prospects returning your calls; form powerful referral alliances; and, create an unlimited flow of quality prospects referrals. Selling in today's business environment is more challenging than ever. But the secret to success isn't longer hours and more phone calls; it's getting better referrals. Sales expert Bill Cates' system of referral-based marketing turns every business contact into a relationship - and every relationship into a sales success.You'll learn how to: sell without worrying about Do-Not-Call lists; develop a powerful referral mindset; network strategically for better results; and much more! If you want to bring in more qualified leads and close more sales than you ever imagined, don't work harder, work smarter - with "Get More Referrals NOW! "'In the three months since of implementing Bill Cates' Referral Marketing System, we have experienced an unprecedented increase in sales. Bill Cates' Referral Marketing system works' - Vincent Arena, Executive Vice-President & Chief Administrative Officer, FCLIC. 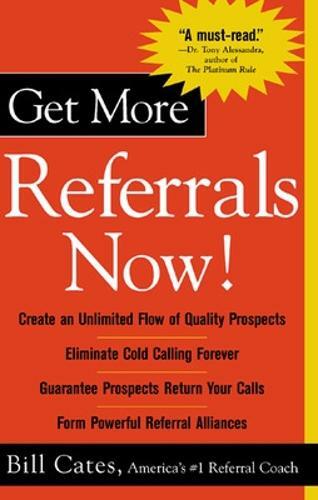 'The answer to the Do-Not-Call List is the unlimited referrals marketing system[registered] from Bill Cates. In today's environment you need to get connected to the prospect in a compelling way. This system accomplishes that' - Bob Walker, MassMutual Financial Group. 'With Bill's powerful system, there are no more cold calls, only warm leads. It's a must-read for anyone in business' - Dr. Tony Alessandra, author of "The Platinum Rule". 'The program Bill delivered 15 months ago has had a lasting impact. Our advisors are acquiring new clients by referrals at a rate that's 40 per cent higher than the national average for our company' - Tim Holland, Field Vice President, "American Express" Financial Advisors. Bill Cates is President of Referral Coach International. A twenty-eight-year sales veteran, he currently consults for such clients as "American Express", Merrill Lynch, Andersen Windows, MassMutual Financial Group, and Mutual of Omaha.